Area: Xingfu Lu. A classic Shanghai street, home to Dada bar, two versions of LOgO, Uptown Records, new-ish gay bar Happiness 42, street BBQ, several small restaurants, and a really dog-friendly park. There's a new development there called Xingfu Li, which runs between Xingfu Lu and Panyu Lu, and has Pie Society, a Taoyuan Village, and a few other bars and restaurants. That's where Anthologia sits. The closest fine-dining experience is Villa Le Bec, just around the corner on Xinhua Lu. 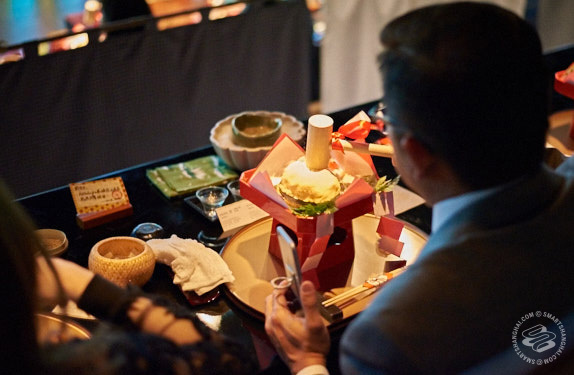 What It Is: A theatrical, eight-course modern-Japanese prix fixe adventure through sea and land, yours to enjoy for about 1,000rmb. 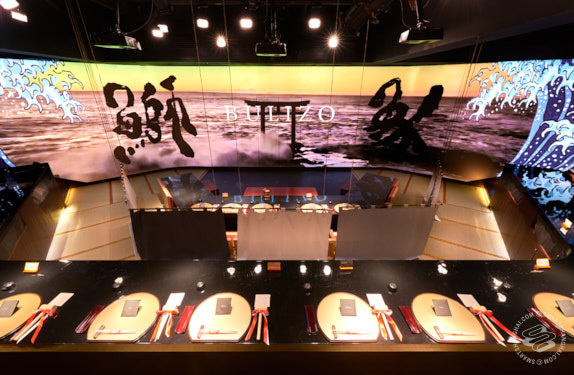 The nightly dinner is eight "stories from our earth", each illustrated on a giant, curved video screen displaying tunas swimming and happy cows frolicking and free range-ing to the sounds of bebop as the Wagyu is served. 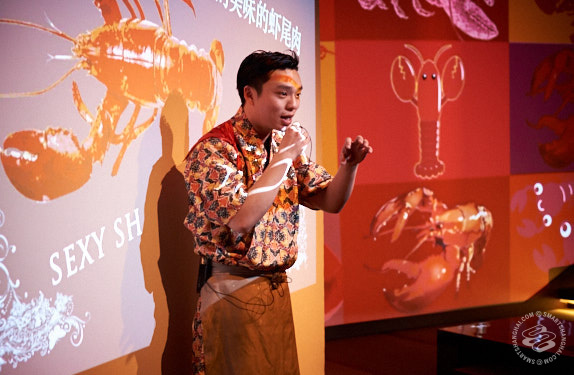 During the shellfish chapter, crustaceans flash on the screen like Pokemon as a waiter raps about lobsters over a future bass beat reminiscent of Cashmere Cat. Seriously. It's a ride. 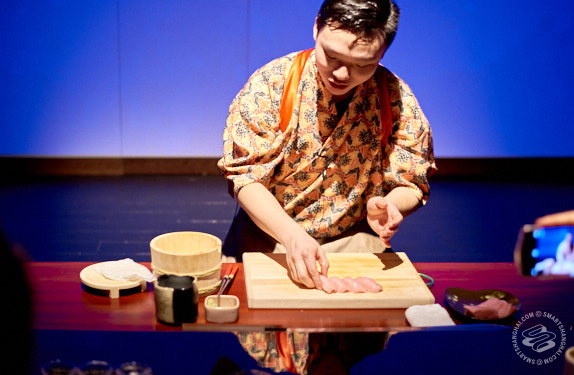 Waitresses and chefs are decked out in bright, traditional clothing, with the latter wielding a giant katana to cut tuna on stage. Sounds perfect for WeChat Moments, right? This is the latest project from Fulu Restaurant Management and their president Hirano Naoya. You probably know some of their other places: Elefante, Sushi Oyama, Ochobo, Happy Clay, and Kappo Yu. Hirano and his company manage that whole part of 20 Donghu Lu, dating back to when he brought in Willy as a chef there for the original El Willy. You know that yellow elephant sculpture on Donghu? Hirano made that, as well as the foldout menu and a bunch of the plates and decor at Anthologia. Edited the videos too. Crafty guy. This is kind of his dream project, and he designed the space together with MTM Design. Originally, they wanted to do this at Kappo Yu, but the neighbors did not appreciate the subwoofers. Philistines. Atmosphere: Surreal, playful, casual, possibly seizure-inducing, and non-smoking. Dim lights and nature vibes. Music changes according to the course, flowing through speakers designed by Kobe company TOA, who outfitted the place with a system that lets people hear the music and the people at their table, but not conversations at nearby tables. Really a lot of playful design elements here -- too many to list, but here are a few: lobster arrives in a giant, lobster-shaped bowl; citrus-scented particles breeze through the air during dessert, when balloons tied to the pastry tray sway behind a sunset on the screen like the ending to a video game; one can choose from a dozen or so eccentric sake cups; sushi sits on little plates made from some clay Hirano found in Jingdezhen. They look like graham crackers. For some of the videos, Hirano bought some 4k cameras for his father and friends and basically told them to go film some nature. Naturally, the toilets are Japanese, with several options for heating and washing. Kind of sounds like rummaging around in someone's eternal sunshine of the spotless mind, right? 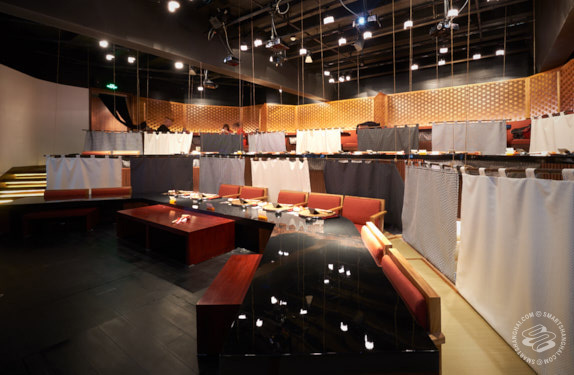 Damage: Set menu only here, which runs 980rmb per person for eight courses, served from 7-9.30pm to 46 seats. This menu changes every two months, but for now features 1) "Salt Baked Rosy Seabass and Happy Kagami-Mochi" 2) Monk Fish (the light fish from Finding Nemo 3) Lobster, 4) "White White White White Japanese Radish" 5) "Three Parts Of Tuna In Three Ways" 6) "Wagyu Beef, Charcoal Flavor, Memories Of Last Summer" 7) "Hairy Crabs, Hot Pot Rice, Texture Of The Bamboo Shoot Festival In Your Mouth" 8) "End Of The Day, Winter Sky, Seven Yuzu Dessert With Romantic Aroma." The only a la carte options are beer, sake, and other drinks. They close on Sundays but might host private parties. Who's Going: They just opened two days ago, so, friends of folks who work there. Soon: fans of Hirano's other restaurants, Japanophiles, and people in search of a new experiences, to say the least.